Implant supported auricular prosthesis requires a minimum of 6mm bone depth in the temporal bone area behind external auditory meatus. Extra oral implants are available from 4mm to 7mm length with 5 to 6mm diameter flange. When the bone height is compromised and when only few regions have favorable positions which are not part of the slot area all the existing extra oral systems cannot be used. In cases with compromised bone condition, a custom made implant is the best choice that can offer good prognosis. 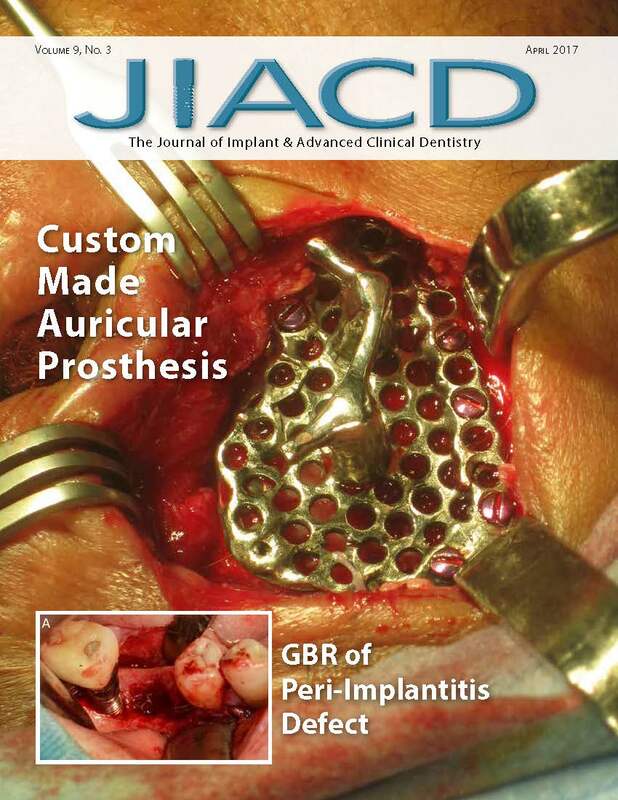 Peri-implantitis is among the most common pathological conditions encountered in the field of implant dentistry, where regenerative therapy, when possible to perform, is needed. One of the reasons why bone regeneration in peri-implantitis defects is difficult: due to prosthetic reasons, submerged healing is often not possible to perform. Another difficulty arises particularly in cases of insufficient attached keratinized mucosa (KM), where the mobility of alveolar mucosa can increase leakage of grafting materials from the treated defect. After a healing period of 5 months, an implant was placed in position #30 with further bone augmentation. Concentrated growth factors (CGF) have positive impact in the field of regenerative medicine. The osseointegration properties of CGF around loaded oral implants were evaluated in this study by means of computerized textural analysis in Panoramic Radiographs. All selected features achieved Area- Under-Curve (AUC) values within 0.77–0.81 range in the group with CGF employment and manage to capture the significant temporal textural differentiation that can be attributed to CGF properties. In last few decades, implant dentistry has emerged as a fully accepted discipline in dentistry. During this period of development, its concepts, treatment modalities and material science have undergone tremendous changes. The key to successful restorative driven implant therapy is appropriate examination, diagnosis and treatment planning to achieve optimal functional and esthetic results.